Basil comes in over 150 varieties. Here is a trio grown in Renee’s Garden. Photo courtesy of Renee’s Garden Seeds. by Jacqueline A. Soule, Ph.D.
Summertime is basil-time in the Old Pueblo. As the nights turn to their sultry summer phase, the sun provides light for hours on end, and the soil temperatures become toasty warm – in other words, we enter our tropical phase of the year – and basil is truly delighted. 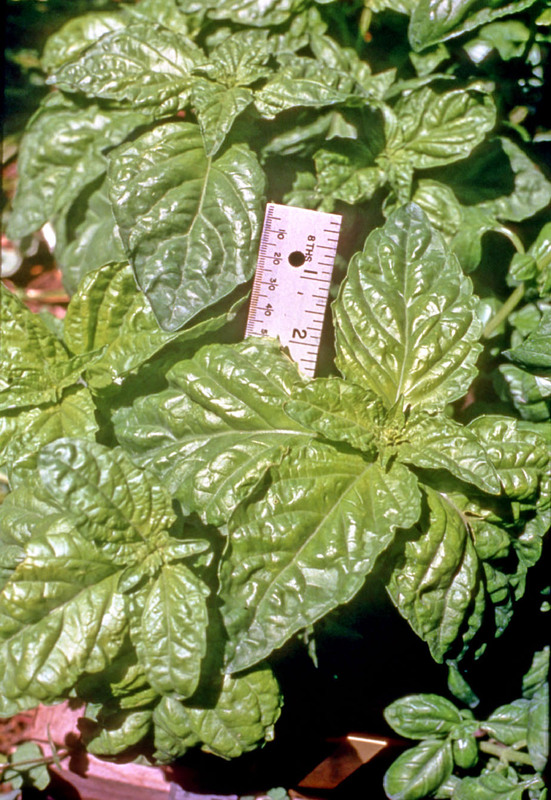 Originally native to India, basil is genetically a tropical plant, even though it is now grown around the globe wherever (and whenever) it is warm enough. Mrs. Burn’s Famous Lemon Basil is a lemony flavored basil that grows well indeed in our climate. Photo courtesy of Native Seeds/SEARCH. Basil is a real taste treat. It can be used in Italian cooking (like the pesto recipe below), fresh, in green salads, and it even has a reputation as a medicinal herb. 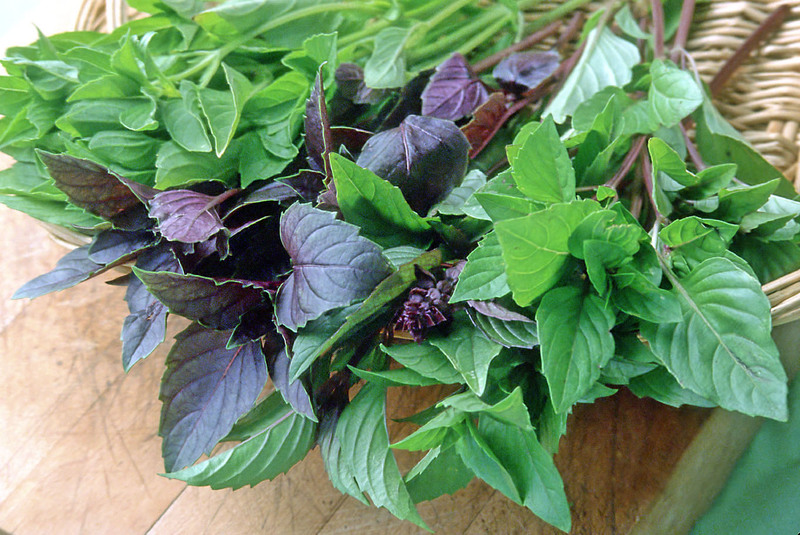 Salad leaf basil features large leaves. Not as strongly flavored as other basils, it does taste great in salads. Photo courtesy of Renee’s Garden Seeds. 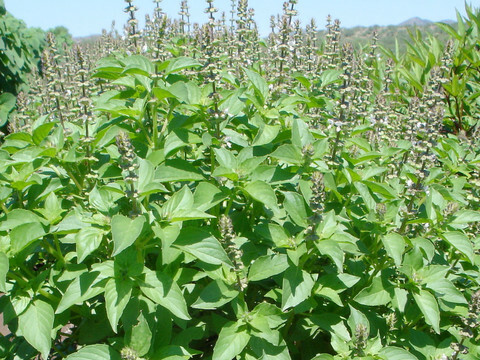 Basil does grow well in the Tucson area, but it isn’t the easiest herb to grow. It has some very specific preferences if it is to thrive. I will put growing tips up on my Gardening With Soule blog on June 4th. Why wait? Because the 4th of each month is national “You Can Grow That” Day. 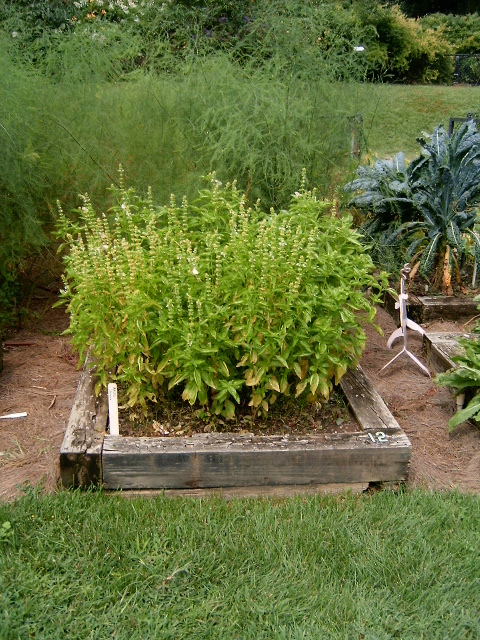 I was in Philadelphia and spotted a bunch of basil growing in a raised bed. Ideally, you want to pinch the blooms off to encourage more leafy growth. The National Institute of Health reports that Americans consume too much salt. Cooking with flavorful herbs like basil could help you reduce your salt use and stay heart healthy. Here’s an easy to make pesto to get you started. 1. Rinse basil and pat dry. 2. Toast pine nuts in an ungreased skillet over medium heat until golden. Cool. 3. Place cooled pine nuts, basil, garlic and olive oil in a food processor or blender and puree until creamy. 4. Stir in the cheeses and serve over pasta or rice. Also excellent with quinnoa or toasted tofu. Vegans can omit the cheese or use shredded soy cheese. Jacqueline’s latest book “Fruit and Vegetable Gardening in the Southwest” (Cool Springs Press, 2014) is available at Tohono Chul Park and the Tucson Botanical Gardens. It is divided into warm season and cool season growing so you can easily select other plants to grow this summer. All text and all photos (except where noted) are copyright © 2015 by Jacqueline A. Soule. All rights reserved. I receive many requests to reprint my work. My policy is that you may use a short excerpt but you must give proper credit to the author, and must include a link back to the original post on our site. Photos may not be used. 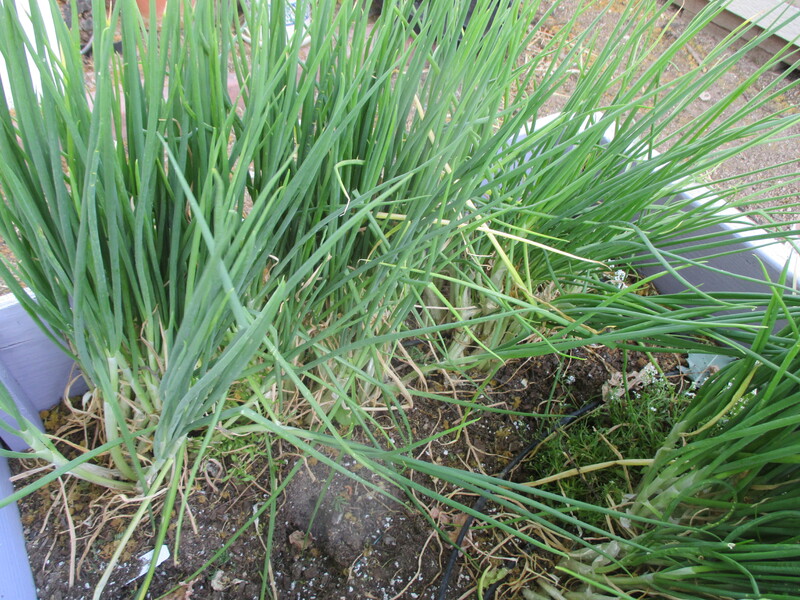 Big clump of I’itoi onions. All this from just one little onion planted last October. I had to put my vegetable garden to bed for the summer early this year since we were leaving for a month. No use having the housesitter water for the weeks we were gone as the hot weather would overcome the vegetables about the time we got home anyhow. The plants were at the end of their season, but still pulling them up was almost as painful as putting down a beloved pet. I go through this mourning every year when one by one the winter crops reach the end of their production – first the peas, then the broccoli, then the last of the lettuce and spinach even in the shade. The kale was still so hearty I simply could not consign it to the compose bin. After freezing some for soup and making as many kale chips as we could handle, I dug up the plants and put them in a pot to transfer to a friend. 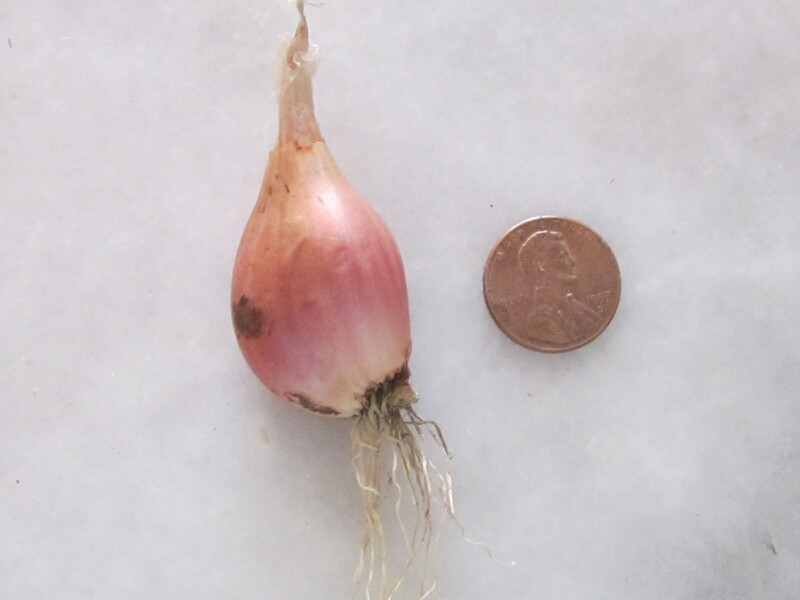 Lovely little I’itoi onion with penny for size comparison. 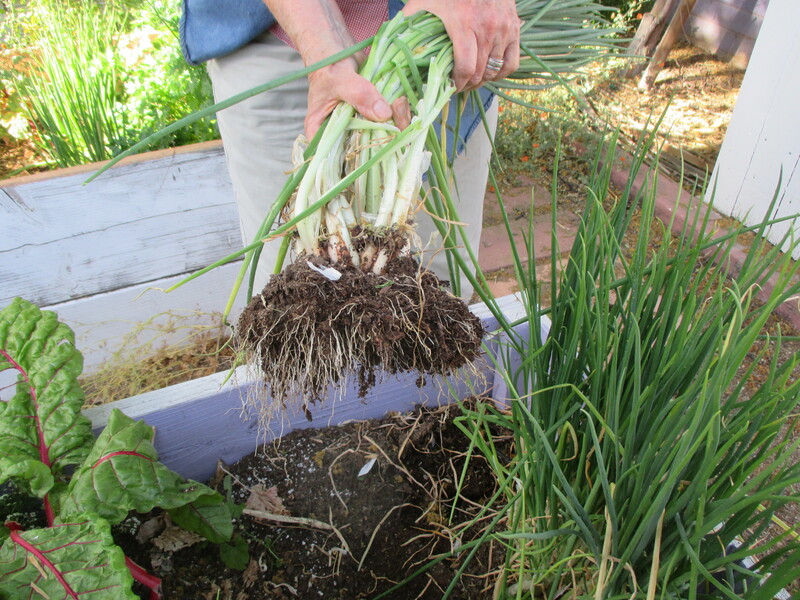 I’itoi onions were brought to the Southwest in the 17th century by Spanish missionaries, but have become such a part of the Tohono O’odham biology that they are called by the name of their creation diety, Elder Brother, or I’itoi. These little gems were beginning to die out when they were brought to Native Seeds SEARCH by a Tohono O’odham woman. They are one of the plants in the Slow Food Ark of Taste. To prepare onions for cooking, first separate and clean off the dirt, then peel. Like most onions, these contain potassium, vitamin C, folic acid and vitamin B6. Onions contain substantially the same amount of vitamins and minerals when cooked. I’itoi onions can be substituted for onions or shallots. You can find them at farmers’ markets and from Crooked Sky Farms in Prescott and the Phoenix area and from Native Seeds SEARCH. Both of these places will ship to you as well. A healthy row of iItoi onions. You’ll have a ratio of green tops to bulb of about 10:1 so you’ll have to find a use for all the green onion tops. When you’ve used all you can fresh, freeze them to add to soup stock later. 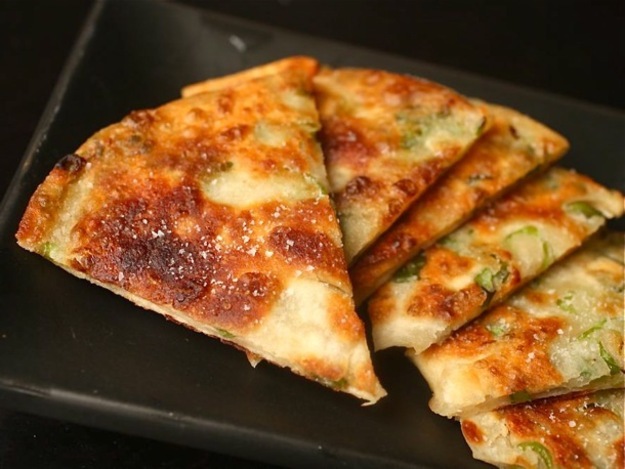 You can also make delicious Chinese Onion Pancakes. It’s easy, but rather than recount the recipe here, go to this link. These are the best directions I’ve found for making this delicacy and the author also gives a wonderful tutorial on the difference between adding cold and hot water to flour. If you’d like a recipe to show off your onion harvest, this one is easy and delicious. I’itoi onions cooking for Sweet and Sour sauce. Here’s my recipe for sweet and sour I’itoi onions. You can use red wine and red wine vinegar or white wine and white wine vinegar. Makes a great topping for grilled fish or chicken or mix it into steamed vegetables to add flavor. 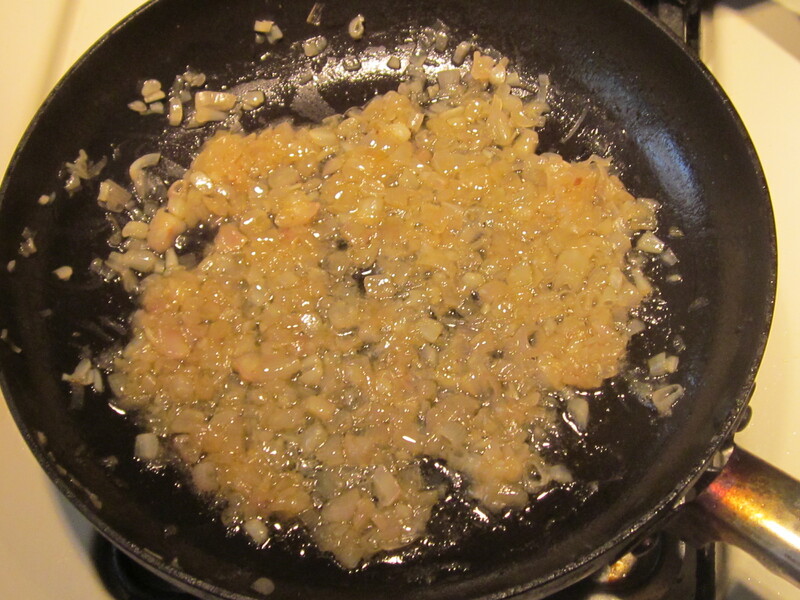 In a large heavy frying pan, cook sliced I’itoi onions and water covered over very low heat for 10 minutes until soft. Add wine, wine vinegar, olive oil and sugar or agave syrup. Cook over very low heat for another 10 minutes. If you are interested in wild and heritage foods of the Southwest, check out my cookbooks Cooking the Wild Southwest, Delicious Recipes for Desert Plants, and the Prickly Pear Cookbook. The books are also available through Native Seeds/SEARCH. For inspiration and directions on what wild plants are available in what season, watch a short video here. Tia Marta here inviting you to return to the hallowed soil of Schuk-shon–Tucson’s Birthplace “Black Spring”–at the foot of “A” Mountain, in the new Mission Garden, to the very site of the original garden supporting Mission San Augustin de Schuk-shon. The Feast of San Ysidro Labrador is approaching. May 15 is the traditional Dia de San Ysidro, Saint Isidor, patron saint of farmers and gardeners. According to legend, San Ysidro Labrador was so hard-working and generous with his produce to all in need—people or animals–that angels would plow next to him to triple his crop. In my artistic interpretation, San Ysidro lies exhausted under a tree from working his field while an angel guides his ox to finish his plowing. Here in my big-scale heirloom bean mosaic, the “medium is the message”–in part. It was assembled using more than 21 colorful varieties of Southwestern heirloom beans and seeds, grown out from the Native Seeds/SEARCH Collection, in Tucson, Arizona. 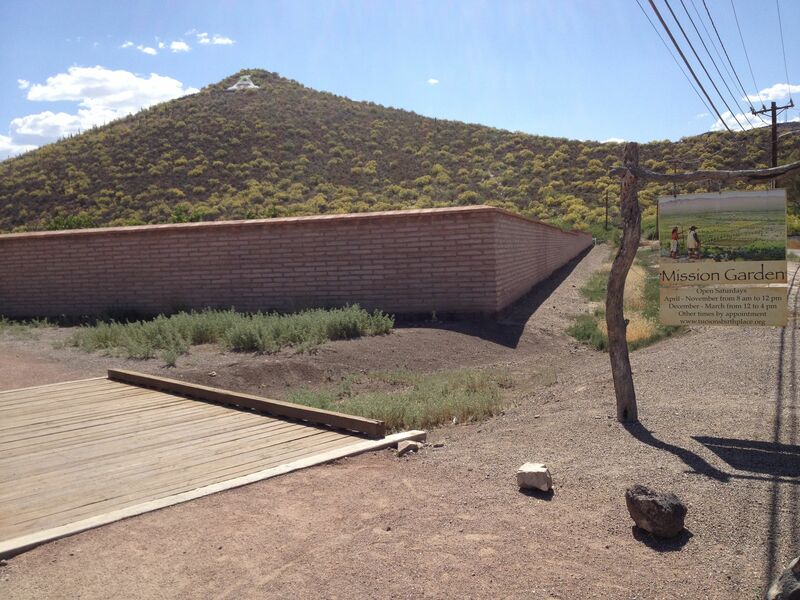 This year, our San Ysidro fiesta will be celebrated on Saturday, May 16, within the adobe-walled orchard of living agricultural history, Tucson’s newest “museum park” sponsored by the non-profit Friends of Tucson’s Birthplace. Planted in this living museum are representative crops that have fed the sequence of Tucson residents over the last 4100 years. Seeds of these ancient crops were blessedly conserved by the caring staff and volunteers of NativeSeeds/SEARCH over the past 34 years. 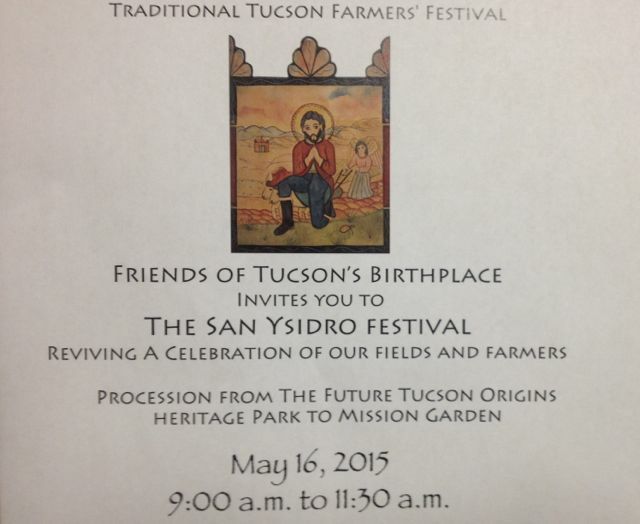 The Dia de San Ysidro celebration will officially begin at 9am with a procession from the future Tucson Origins Heritage Park next to the Santa Cruz “river” channel to Mission Garden’s east gate at 929 West Mission Lane, just east of Grande (Mission Road.) Festivities will include music by Mariachi Las Aguilitas from Davis Elementary, Alabanza with Bobby Benton, a presentation by historian/author Dr. Tom Sheridan, Native American four-direction prayers and blessing of the fields, food, and animals, and the Tohono O’odham Desert Indian Dancers from San Xavier. Designs for the new cultural theme gardens (Chinese, Mexican, Afro-American, and Medicinal) will be unveiled. The combination of high protein Native Teparies and delicious low-gluten Heirloom Wheat Berries makes this a rich and nutritious stew. Carefully sort dry beans to remove stones. Wash, rinse, and cover with good water to soak overnight. Drain when plumped and ready to cook. In big cooking pot, put beans, marrow bone, and drinking water to cover. Bring to a boil then simmer for 2+ hours. Separately, rinse wheat berries and drain. Add wheat berries and salt to the cooking teparies. Add more water and/or stock. Bring to boil, then simmer an additional 1 ½ hours or until wheat berries are round and tender, and teparies are tender(not chewy). Reserve excess water for later soup stock. Remove bone. For serving, posole should be moist with broth. Add black pepper and sea salt to taste. If picante bite is desired, add one or two crushed chiltepine peppers. *Native tepary beans are available at www.nativeseeds.org or at www.ramonafarms.com . 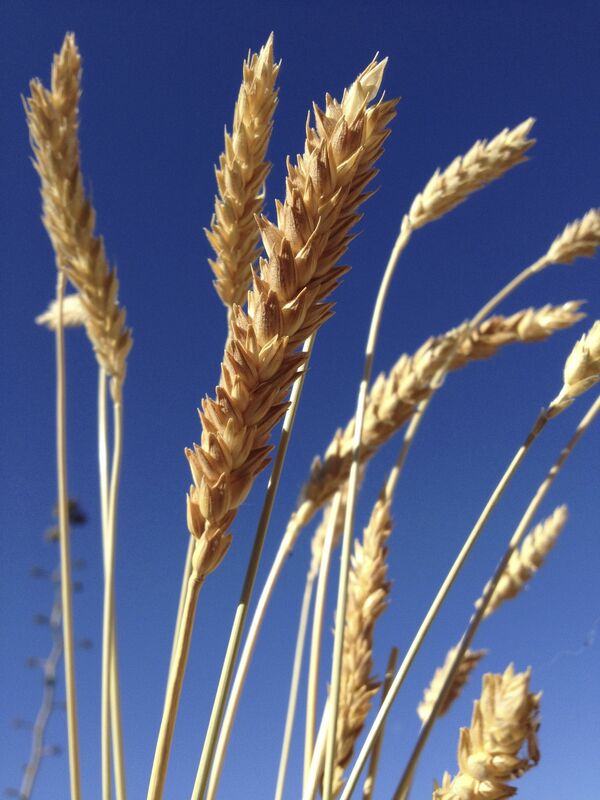 ** Organic White Sonora Wheatberries are available at Flor de Mayo tent at Sunday St Philips Farmers Market, Tucson, or at the NativeSeeds/SEARCH Store, 3061 N Campbell Ave, Tucson. 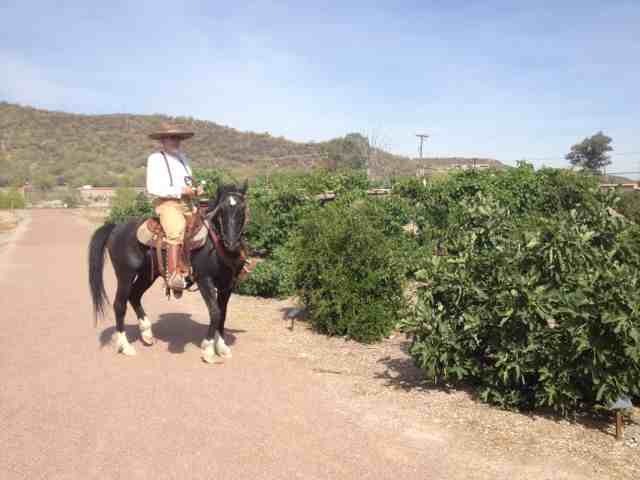 ***whole wild-harvested chiltepine peppers are available at Flor de Mayo tent, Sunday St Philips Farmers Market, Tucson, or at the NativeSeeds/SEARCH Store, Tucson. 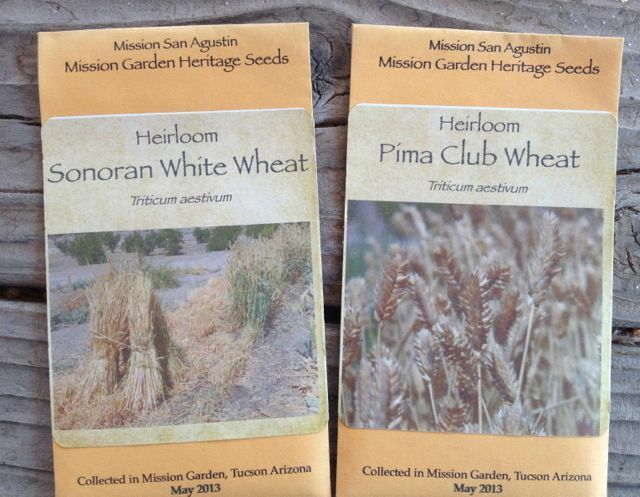 Seed packets of heirloom wheat varieties grown at Mission Garden, for sale to plant in your own winter garden. 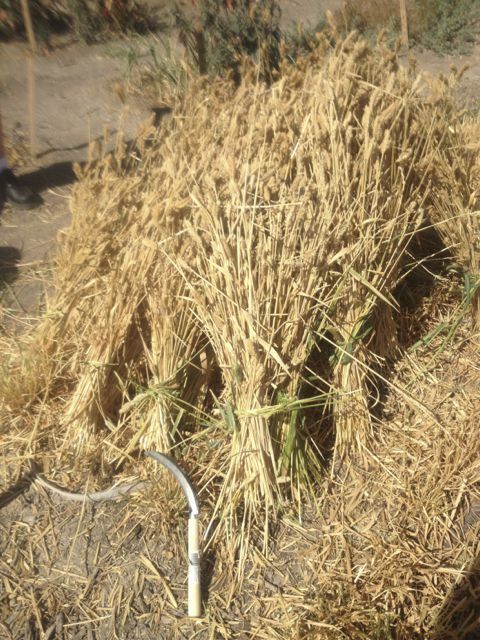 Because Dia de San Ysidro especially heralds the wheat harvest, the staple grain introduced by Padre Eusebio Kino and other missionaries over 300 years ago to the Native Tohono O’odham community living here, this year’s festivities will include a ceremonial wheat harvest, guided by expert plantsman and Desert Museum staff person Jesus Garcia, to take place around 8am, Saturday, May 16, before the procession. Support organizations, such as NativeSeeds/SEARCH, San Xavier Coop Association, BKWFarmsInc, and Tucson Herbalist Collective will have booths with demonstration items, tastes of native foods, solar cooked White Sonoran Wheat berries, traditional food products packaged for sale, and resource people to talk with about desert gardening for real food. The event is free with a donation requested. Find out more details of the San Ysidro Festival at www.tucsonsbirthplace.org. Hope to see you there!